incorporating the most advanced hair care technologies, ensuring easy, quick and safer results. 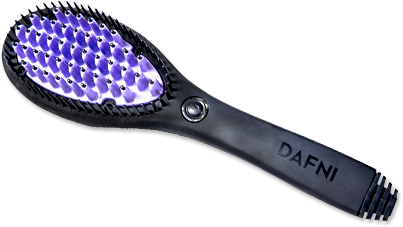 The Original DAFNI Ceramic Hair Straightening Brush comes with Patented 3D Technology. DAFNI Hair Straightener simply brushes your hair to give it straight and smooth finish within minutes. DAFNI Hair Straightener Brush is made of high quality materials, and was developed based on revolutionary technology and a unique patent pending 3D ceramic surface design. It remains constant on the top recommended temperature of 185 ̊ which is healthier for your hair and enables you to effortlessly look great.DAFNI Hair Straightener is the ultimate portable hair styling brush for women. - Top recommended healthier temperature of 185 ̊ - no more burning and singeing your hair!